Personalized Messenger Bags in Bulk, Custom Embroidered, Printed or Blank. Promotional, Inexpensive. Black with Athletic Gold, Red, Royal Blue, Purple, Lime Green, Black, Orange, Gray trim. 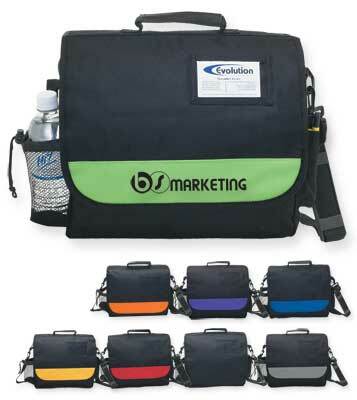 Inexpensive wholesale personalized Business Messenger Bag with handle and adjustable and detachable shoulder strap. We also supply wholesale blank (not imprinted) Business Messenger Bags. Budget Prices in USA and Canada for customized Messenger Bags. American clients pay no taxes.